The Ghostbusters birthday party she threw for her son’s 5th birthday is oozing with creative ideas. Don’t miss a single paranormal detail – slime-based party games, party favors, a ghostly birthday cake and cookies as well as party decorations and supplies inspired by the movie. 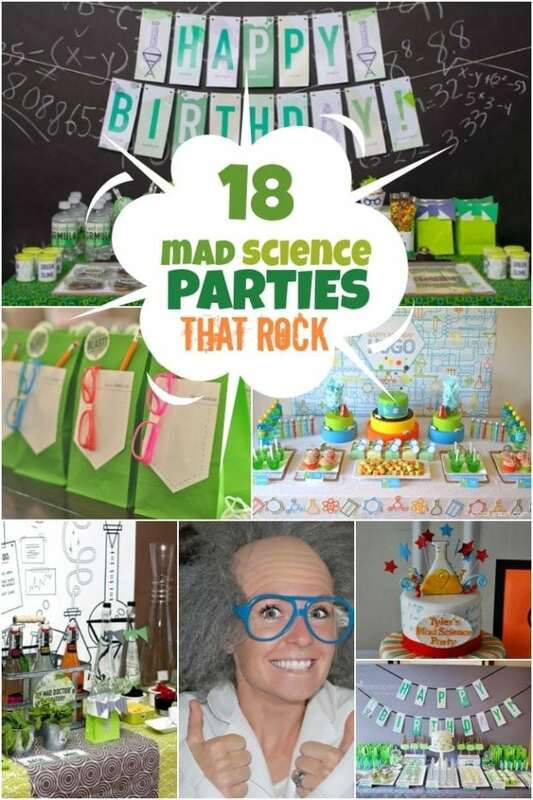 Zero in on these unique mad science birthday party ideas. You’ll love this mad science birthday party favor idea. When you have a son obsessed with Ghostbusters, it comes as no surprise when he requests a Ghostbusters birthday party. Such was the case with Adriana of Quaintly Garcia and her son, JD. Anyone who grew up during the 80s will remember the paranormal activity, scary ghosts, and ectoplasm from this classic movie. Adriana incorporated a lot of the fun elements from the movie into her party designs. 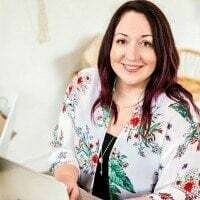 One of her son’s favorite scenes from the movie is set in a library, so she used her connection with a local school to secure the party location. How great is that? Staying true to her son’s favorite quotes and scenes in the movie was important to Adriana. A Ghostbusters birthday party requires ghosts. You can’t get much better than being welcomed by the Stay Puft Marshmallow Man holding a birthday banner. I love how Adriana staged her desserts on a wooden library table. Stacks of books and a card catalog served as perfect accent pieces. Not only are they in keeping with the library theme, but they also add height and dimension to the table. Colorful agate balloons added a great pop of color. Framed quotes from the movie provided awesome details that all true Ghostbuster fans will appreciate! Notice the classic Ghostbuster posters hanging on the walls? Way cool. Adriana chose perfect treats to coordinate with the theme. Twinkies were lined up on a white platter, surrounded by Ghostbusters figurines. Beautifully detailed Ghostbuster logo and Slimer cookies, by Sunflower Baking, added a special touch to the dessert spread. Ghost-shaped Peeps hovered on paper straws – they look awesome against the slime green platter and peeking out of green gum balls. Veronica, of VLuna’s Cakes, created an extraordinary two-tiered cake with the characters and a city scene. Green slime oozing down the card catalog was a fun, creepy touch. In addition to the dessert table, Adriana set up an indoor S’mores roasting station. I wonder how Mr. Stay Puft Man liked that?! The seating area held striking table centerpieces made from a combination of floating balloons, #5 (for the birthday age), Ghostbusters character toys and fun, themed accents. Place settings had layered green and black plates, striped paper straws and custom labeled gable boxes. The yellow and black caution tape is a great touch. No Ghostbusters party would be complete without lots of Ectoplasm (slime) so the kids had fun learning how to make and bottle up their own. Birthday boy was dressed for the part; his costume is perfect! Grandpa built the awesome proton pack and gun for him. Bashing a piñata was a satisfying follow-up to the ghost hunt. This was one awesome Ghostbusters birthday party! Dr. Egon Spengler: Funko POP! Dr. Peter Venkman: Funko POP! Stay Puft Marshmallow Man Funko POP! Dr. Raymond Stantz: Funko POP!